He’s been a big supporter of our cause ever since our very first event & a constant presence on the all-star DJ team ever since 2008. Previously involved with the likes of pioneering black music stations such as Radio Invicta & Horizon back in the late 1970’s & 1980’s, he’s also enjoyed subsequent long stints at Starpoint Radio & Solar Radio respectively. Throughout his years in club land he’s racked up numerous residencies in around the capital city including ones at famed night spots such as Le Beat Route, Samantha’s & The Production Village. In more recent years Richard has been part of the Salou Soul Weekenders, the Campsoul Music Festival & was our special guest at Brews & Soul back in January. 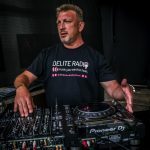 Currently Richard is head of music output for our official radio partner for 2018, Delite Radio, where he also presents his own show 5 days a week on the station. Catch the man like Felstead on the Main Stage at Summer Soulstice 2018!